We describe an approach that may allow to study changes in the γ-aminobutyric acid (GABAA)receptor distribution with development and pharmacological treatments in living neurons. We produced expression vectors containing chimeras of the green fluorescent protein (GFP)linked to the C terminus of GABAA receptors α1, γ2, or the δ subunits. Human embryonic kidney (HEK) 293 cells were successfully transfected with α1-GFP cDNAs together with β3 subunit as indicated by the formation of green fluorescent clusters of receptor subunits that colocalized with immunospecific staining for the α1 subunits and by whole-cell recordings of GABA-activated Cl− currents. Although the current density was lower in these cells, GABA, bicuculline, and ZnCl2 actions were unaltered. Similarly, transfection with cDNAs encoding for the γ-GFP chimera together with α1 β3 subunit cDNAs produced clusters of subunits and GABA-activated chloride currents that were insensitive to blockade by ZnCl2 and that were potentiated by zolpidem. Lastly, δ-GFP tion by the neurosteroid THDOC. We then successfully transfected primary cultures of neocortical and cerebellar neurons with these GABAA receptor subunits—GFP chimeras. We obtained evidence of elongated cluster formation in both cell types that matched well, although not completely, endogenous receptor clusters as indicated by β2∖3 staining, and also partially corresponded to synaptophysin positive punctae indicating synaptic localization of transfected subunits. Electrophysiological recordings from transfected neurons indicated that functional GABAergic synapses were still maintained. 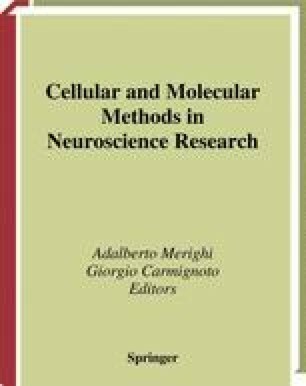 This approach will allow to follow targeting and distribution of GABAA receptor clusters in living neurons during development in culture and in different experimental conditions.